Should you bother to get a Life? When I first saw the previews for Life, I was unimpressed. Despite it having Jake Gylenhaal (who, honestly, I’ll watch in just about anything) and taking place in outer space (where, honestly, I’ll watch just about anything set). Still I noted the title in the back of my mind, as the trailers got longer, I got more excited. Aliens in space and Jake Gylenhaal in a spacesuit! Space horror! SPACE! Did it live up to the excitement of the previous three sentences? Yes and no. 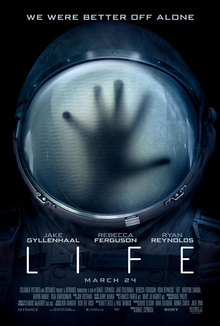 The story follows the crew of the ISS as they make contact with the first sample of extraterrestrial life (hence the not great title of the film). As almost always happens in these type of films: the alien turns out to not just want Reese’s Pieces and love, but rather longs to destroy all humans nearby. The crew is made up of the afore-mentioned Gylenhaal (doing a lot with a not-really fleshed out role, he manages to make his character weighted with a haunting that I’m pretty sure probably wasn’t in the script), Rebecca Ferguson as a protocol-following CDC scientist (and the ISS’s newest member), Ryan Reynolds as a mechanic, Hiroyuki Sanada (who was in the much better—like one of my fave sci-fi films better—space movie Sunshine), Ariyon Bakare (who is quick becoming an actor I look forward to seeing—seriously check out his performance in Jonathan Strange), and Olga Dihovichnaya. Now you may ask why I’m referring to the actor’s and not the character’s names? It’s because that’s how little the characters end up mattering once you’ve left the theatre. The performances stand out, but the characters are written without depth or backstory. You could plug in Doomed Spaceperson #s as their character names and it would suffice. You know whose name I do remember, though? Calvin. The alien at the center of the film. Calvin is, in fact, the life of the movie. Not only is his octopus-like appearance pleasing and scary, but so are his weird floating through air movements (look at the way his body moves through the gravity-less air in comparison to the humans—it’s as if he’s gently moving through water). Arguably, the movie is 100% worth seeing because of Calvin. Is he as instantly classic as the xenomorph of Alien? No, of course not. But he is enjoyable on screen and a clever addition to the long line of interesting space monsters in films and literature. If the film hits all the beats you expect it to, with a couple of small surprises, it does so in a highly competent way—the opening tracking shot delighted me, as did the way the camera often seems to be floating along in the same lack of gravity as the actors. The emotional beats all work within the viewing. I was absorbed and entertained, jumping at all the spots I’m sure I was expected to, but the day after leaving the theatre I hardly remembered having seen it. It’s not as empty seeming as the vacuum of space, but it’s also not as full of all the messy and layered things that make life, well, life. POSTED BY: Chloe, speculative fiction fan in all forms, monster theorist, and Nerds of a Feather blogger since 2016. Find her @PintsNCupcakes.